Harry was born in Hobart, Tasmania, on the 25th July 1933. He joined the School Cadets at Hobart High School in 1946 and rose to be Cadet Under Officer by the time he left school in 1950. In 1952 he was called into National Service, where he reached corporal. After National Service Harry decided to remain in the Army and enlisted as a private soldier, and was commissioned at OCS Portsea in December, 1952. He was posted to Korea in 1954 but that was changed to 2RAR Malaya and he served two years in the Malayan Emergency as 9 Pl C Coy Commander 1955-57. On 18th August, 1966 in Vietnam it was Major Harry Smith's Company which contacted a reinforced enemy regiment in the Long Tan rubber plantation, which was about to move to attack the Task Force base that night in conjunction with another regiment further north. The reinforced enemy regiment suffered horrendous casualties from the 24 guns of the Task Force artillery, the USAF strike he called in, plus the 10,300 SA rounds fired by his men. The enemy started to withdraw at the time of the arrival of a platoon of Bravo Company 6RAR at 1850 hours and the approach from the south of an APC Troop with Alpha Company 6RAR on board. This force contacted two enemy companies 1000m from the battlefield, accelerating their withdrawal and by the time it reached Delta Company the main enemy had withdrawn, leaving over 245 bodies. Delta Company lost 17 KIA and 23 wounded, with the APC Troop losing one man DOW. Harry was awarded the Military Cross in December 1966, downgraded by COMAFV from the original recommendations (by CO 6RAR and COMATF) of the DSO. Vietnamese and US Army awards were rejected by Canberra due an inability to accept foreign awards, although that policy was later changed after embarrassing the US and Vietnamese Governments by rejecting their awards. In 2008, Harry was awarded the Star of Gallantry by the Long Tan Review on the ground that it was the contemporary equivalent of the DSO for leadership and gallantry in action, rather than just for distinguished service. 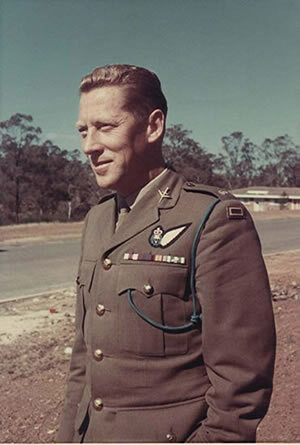 His former Delta Company 6RAR was awarded the USA Presidential Unit Citation in 1968, the Vietnamese Cross of Gallantry Unit Citation in 2008, as offered but rejected by the Government in 1966, and in October 2009, the Australian Unit Citation for Gallantry. Harry was awarded the National Order of Vietnam 5th Class in 1966, and along with the Vietnamese Citation in 2008, he wears the Vietnamese Cross Of Gallantry with Palm, awarded to the unit commander. Harry had a long and distinguished military career which ended when he sustained a serious freefall injury in late 1975 while trialing a new type of parachute which failed to open properly. He was medically downgraded and left the Army in May, 1976. SG (Star of Gallantry), MC (Military Cross), AASM (Australian Active Service Medal) with clasps for Malaya and Vietnam, GSM (General Service Medal) with clasp Malaya, Vietnam Medal, Defence Force Service Medal with one clasp, National Medal, National Service Medal 19511972, National Order of the Republic of Vietnam, Vietnamese Cross of Gallantry with Palm, Vietnam Campaign Medal with clasp 1960, Pingat Jasa Malaysia Medal. Also awarded, the Australian Unit Citation for Gallantry, Presidential Unit Citation (Army) USA, Cross of Gallantry Unit Citation (South Vietnam). 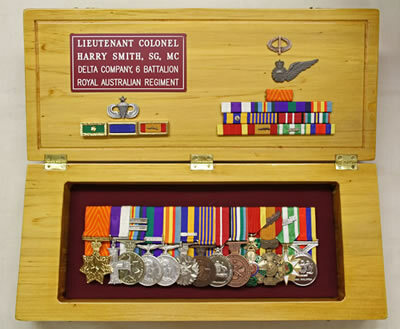 Unnamed medals – It is interesting to note that the two original medals awarded to Harry Smith for Vietnam service are unnamed. In late 1968, he led the Army portion of the Australian Contingent to Paris for the 50th Anniversary of the end of World War 1. The Vietnam Medals had just been released for issue and the unnamed medals were given to members of the Contingent unnamed prior to leaving Australia. The medals to this Contingent were the only ones issued unnamed for Vietnam. Incense burners were one of the many items recovered from Long Phuoc west of Xa Long Tan on Operation 'Enoggera' in July 1966. This one (above) was 'souvenired' by Harry Smith and bought back to Australia. 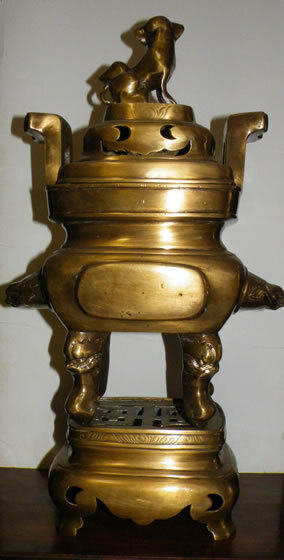 It is thought to be of Confucian religion design, with the 'Dog of Foo' on top. Harry presented it to the museum in 2009.